We just arrived at the Whaley House waiting for our private tour of the house. 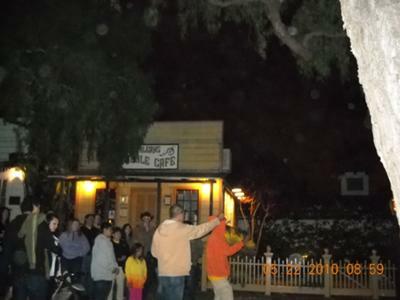 We went around to the side of the house and met a group of people on the Ghost Hunters Tour. The guide had some king of a geiger counter that detects electro-magnetic fields or something like that. It was going off big time, and what it was detecting was moving around close to the ground. That's where we took this picture at. There are more pictures we have some very strange I will upload them soon.